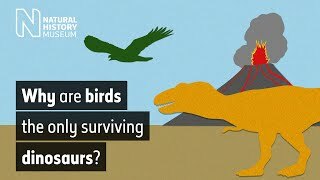 Like birds - the dinosaurs we can see around us today - prehistoric dinosaurs hatched from eggs. Here's how to create your very own dinosaur egg that hatches. Everything you need to make the hatching dinosaur egg. Use whatever colour pencils you prefer. 1. Print out our template of an egg and a baby Maiasaura dinosaur. 2. Glue them to the piece of card. 3. Cut around the outline of the egg as well as the zigzag to cut the egg in half. 4. Colour in the baby dinosaur, then cut it out. 5. Lay the peg on the table. Apply glue to both halves on the side of the peg facing you. 6. Stick each piece of the egg onto a half of the peg. Make sure the pieces meet in the middle when the peg is closed and that the card doesn't cover the peg's hinge. This can be quite fiddly. 7. Apply glue to the bottom part of the dinosaur, on the same side as the drawing. Stick it to the back of the bottom half of the peg, so you can see the creature when the peg is open. 8. Open the peg. Ta-da! Your baby dinosaur is hatching! Note: children will probably need some help cutting out the egg and baby dinosaur, as the pieces are quite small. Maiasaura is a duck-billed dinosaur that lived around 80 to 75 million years ago. Lots of fossils of this dinosaur, as well as nests and eggs, have been found at a site called Egg Mountain in the USA. The name Maiasaura means 'good mother lizard', because its fossils provided some of the first evidence of parental care by a dinosaur. 1. Draw an egg on the piece of card. If you are using a standard-sized peg, it works best if the egg is about 2.5-3 centimetres wide. 2. Carefully cut out the two halves of the egg. 3. Draw a baby dinosaur on the leftover card. You can either make up your own dinosaur, or copy the baby Maiasaura we have provided. Make sure your dinosaur is smaller than your egg. Like bird eggs, dinosaur eggs occur in different shapes and sizes. The smallest are about the size of tennis balls and the largest are like giant footballs, nearly half a metre across. While some eggs were rather round, others were long and thin. Enjoy more dinosaur facts, quizzes and crafts. These unusual biscuits make it look like dinosaurs stomped through your kitchen. Follow these simple origami instructions to bring back this famous dinosaur in paper form.